Restaurants such as Ruby Tuesday offer various cuisines, price ranges and customs, and this is reflected by the menu style they use. Simply put, the menu is a restaurant’s face, and the way it reaches out to patrons like you. Not only are there different kinds of restaurants, but the menus they use vary as well. A cycle menu is a list of menu items or dishes that is changed each day during the cycle and repeated. These menus are usually found in institutional facilities, schools and cafeterias, although some restaurants use them as well. The cycles can last for a month or a week, depending on the number of menu items displayed. The purpose of this menu is to make the items easier to prepare and promote. Du Jour means “of the day’ so salad du jour means “salad of the day”. Du jour menus are changed frequently and concentrate on seasonal ingredients, and emphasis is on preparing food as fresh as possible. Though many restaurants offer specials every day, all the items listed on a du jour menu are special. Du jour menus are sometimes called chalkboard menus because they used to be written there, and most of the highlights are on vegetables and fish that are freshly available the time of the year it is being displayed. Because they’re seasonal, once a du jour menu is changed it will take time before you can see the menu item again. The prix-fixe menu offers you numerous courses for a fixed price tag. Depending on the restaurant the options may include courses for dessert, meat, seafood, intermezzo, soup, salad, appetizer and bouche. While a prix-fixe menu may be costly, at least you get a lot of food options. Prix-fixe menus are usually found only in fine dining restaurants and the ingredients change often as the items are seasonal. A prix-fixe menu is also called the “degustation menu” or the “chef’s tasting menu”. An a la carte menu is more pricing than a menu type, as the form is determined by what you order. For instance, the main dishes are not organized with side items for a single price, as you can order vegetable, meat and starch separately and pay separately. What makes a la carte menus popular is you can have a lot of variety in your food, and it can be customized in some restaurants. Static menus are the traditional menus served in restaurants and are laminated or printed. They’re frequently used in diners, fast food chains and casual diners, with the categories divided into salads, soups, appetizers, sides, desserts and entrees. Because people are very familiar with the layout, they’re used very often, making it easy for the patron to find what he or she wants. 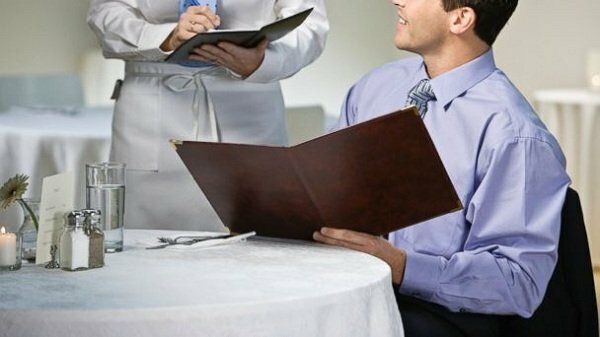 So the next time you visit Ruth’s Chris Steakhouse or another diner, take a good look at their menu, and you’ll see that there’s more to these menus that you might have thought, as it says a lot about the restaurant itself.